This research project is jointly managed and funded with the US-based A-T Children’s Project. Ataxia-telangiectasia (A-T), caused by mutations in the ATM gene, is a disease associated with various pathologies, particularly progressive loss of certain nerve cells and defective DNA repair. 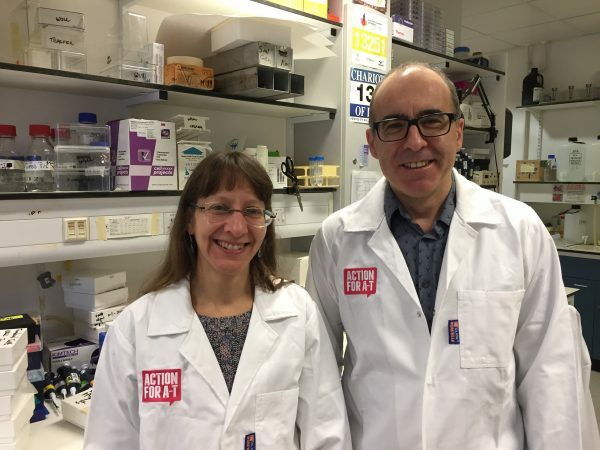 Building on their recent progress, the team aim to determine how changes in other genes might alleviate symptoms of A-T in cells, with the hope that these changes could also alleviate patient symptoms. There are currently no treatments for A-T. The team in Cambridge hope that their planned studies will provide significant new insights into A-T and ATM biology, and might also identify potential drug targets for slowing A-T disease progression. 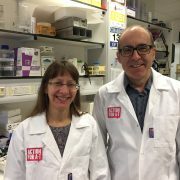 Steve and Rimma are working with cells they have obtained from patients who, despite possessing inactivating ATM mutations, have strikingly mild symptoms. Having determined the DNA (genome) sequence of these patients, they are now identifying possible mutations (in genes other than the ATM gene) that might alleviate A-T symptoms. Having already “reprogrammed” cells from mild A-T patients into induced pluripotent stem cells, they will next differentiate them into nerve cells and compare their properties and functions with cells derived from control patients with or without A-T. They also plan to couple this work with revolutionary CRISPR-Cas9 gene editing methods, which they have recently used to identify genes that, when mutated, alleviate DNA repair defects of ATM-defective mouse cells. The proposed work could identify modifiers of A-T, therefore improving the ability of clinicians to counsel/advise patients and their families regarding their disease and its likely progression. It is also possible that the proposed work will identify opportunities for clinicians to advise on how progression of A-T might be slowed down by drugs or other agents.